Is privilege real or imagined? It’s clear that issues of race and equality have come to the forefront in our nation’s consciousness. Every week yet another incident involving racial tension splashes across headlines and dominates our news feeds. But it’s not easy to unpack the origins of these tensions, and perhaps we wonder whether any of these issues really has anything to do with us. Ken Wytsma, founder of the Justice Conference, understands these questions. He has gone through his own journey of understanding the underpinnings of inequality and privilege. In this timely, insightful book Wytsma unpacks what we need to know to be grounded in conversations about today’s race-related issues. And he helps us come to a deeper understanding of both the origins of these issues and the reconciling role we are called to play as ministers of the gospel. Inequality and privilege are real. The Myth of Equality opens our eyes to realities we may have never realized were present in our society and world. And we will be changed for the better as a result. Ken Wytsma has written a book that will help us think deeply and biblically about our prejudices. 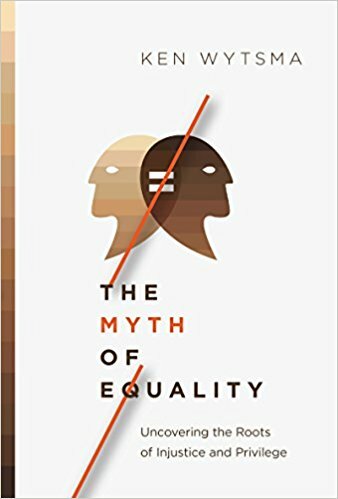 The Myth of Equality: Uncovering the Roots of Injustice and Privilege narrates the history of racism and white privilege in America. While I believe that this book (and the accompanying conversation) deserves everyone’s time, I want to specifically note the importance for Christ-followers. The Bible is rather clear that God’s Kingdom is a kingdom made up of every tribe, tongue, and nation. Therefore, racism has no place in God’s kingdom. Additionally, as Wytsma mentions, “Jesus did not cling to privilege, and because we are called to be like him, neither should we.” Privilege has no place in God’s kingdom. Christian brothers and sisters, when we have, contribute to, and perpetuate attitudes, mindsets, opinions, and actions that are contrary to biblical principles, not only do we make a mockery of ourselves in the public eye, we also drastically misrepresent Christ. Wytsma’s approach in this book is beautifully balanced. He is not overbearing, but does not let the reader off the hook. His arguments are pastoral in tone yet academic in substance. He also mixes in a bit of apologetic – attempting to convince the reader to seriously consider their own viewpoints. This subject, in particular, has the potential to get people so angry that meaningful conversation can be a commodity that is difficult to find. Wytsma has not simply gotten up on a soap box to rant and rave. It is clear that he is genuinely passionate about the issues surrounding race that continue to plague our country and has done his homework in order to paint a clear picture of where we have been as a country and offer solutions as to how we can grow and mature. Because of the effects that sin has on our minds, we are in constant need of guidance – shepherding. And Christians allow pastors and authors to do this sort of work all of the time – we are moved to action by a sermon, change our communication style with our spouse because of a recent read, or jump into a missions opportunity after a friend challenges us. But rarely do pastors and Christian authors specifically shepherd in regards to this specific subject. I have heard a few sermons over the years that deal with racism and there have been a smattering of books. But I’m not sure that I have ever heard a white pastor or Christian author deal directly with the issue of white privilege. To be fair, I have notes of both approval and disagreement all over this book. I engaged with it deeply. And if Mr. Wytsma and I were to sit down and chat for a bit, we could disagree over plenty. But we would agree on the major points. As I have said before, my aim on this blog is to help you, the reader, determine if this book is worth your time and money – not to nitpick every jot and tittle. This book is with your time, your money, and your attention. Any disagreements I have with the book are overshadowed by the weight of its importance to the Christian reader. My challenge to you – potential reader – would to be willing to approach this book with your sword in its scabbard and your shield by your side. I promise you that what you will find in these pages in not an author ready to strike at your faults, but pleading with you to take a serious look in the mirror and submit your broken mind to Christ. It’s worth it friends. It’s worth it.